Chiang Rai is like the younger, less popular sister of Chiang Mai in Northern Thailand. It doesn’t get as much attention as a destination as Chiang Mai does, but in a way this is good for the intrepid traveler as it means fewer crowds and a more authentic experience. 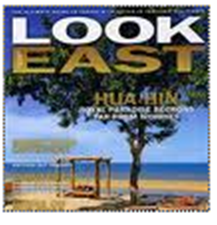 And it’s the perfect base from which to explore the Golden Triangle region. Most of the visitors here are Thai instead of foreign, because there are some sites that locals would consider amongst the most spectacular in the country. 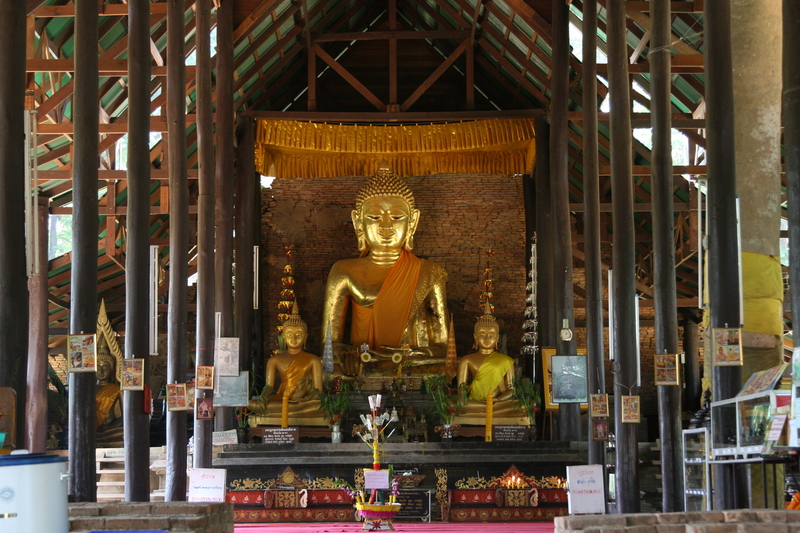 For example, there is Wat Klong Wiang which is one of Thailand’s oldest temples dating back to 1432. 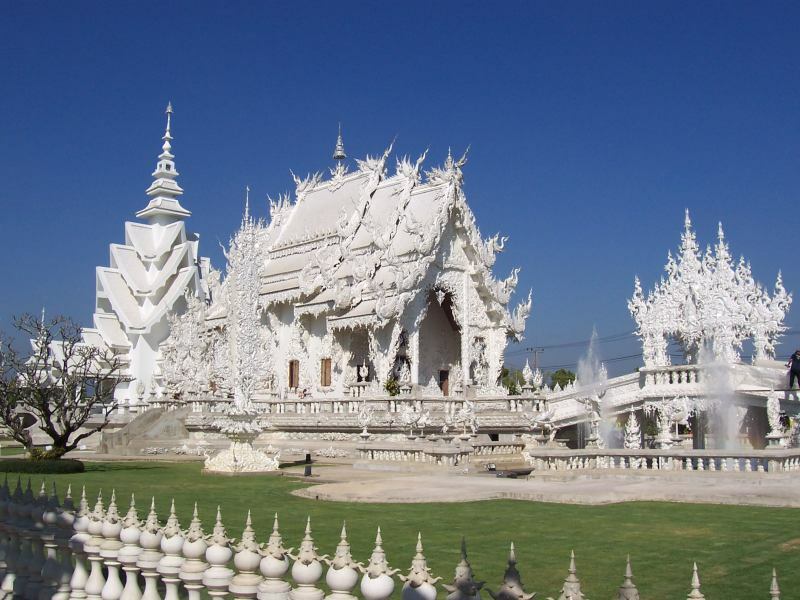 And then there is one of the newest temples, and the most famous in Chiang Rai is the Wat Rong Khun, otherwise known as the White Temple, built in 1998. 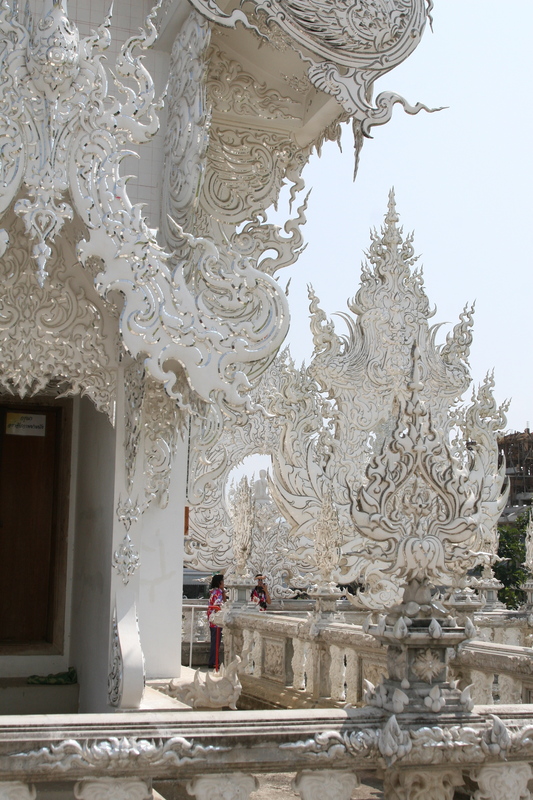 The White Temple is amazing thing to see – especially on a bright day when the glare can be blinding. It just rises out of nowhere as this glittering spectacle. The details in the architecture are incredibly intricate and are best viewed against the contrast of a bright blue sky. 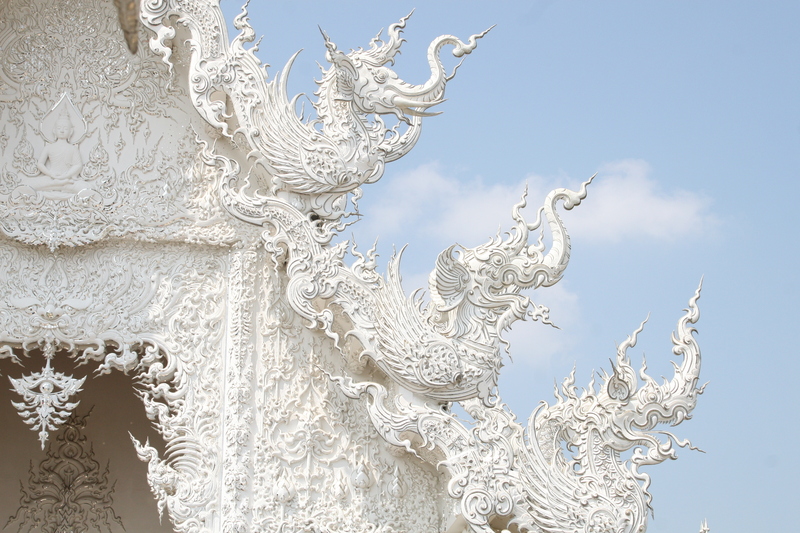 The White Temple is very unconventional with symbols from both Buddhist and Hindu traditions. Inside the temple (not pictured here) are images of Neo from the Matrix, Superman, Batman and even a plane smashing into two towers. Yes, really! The artist, Chalermchai Kositpipat, believes that these images further Buddha’s message to the masses and that by sharing Buddha’s message he will receive the gift of immortality. There are a great many more important historical temples, called “wat” in Thai, in Chiang Rai. Many of them are among the oldest in Thailand – dating back to the 1400’s, several of these temples represent the history of Buddhism in the country. While many have been refreshed or updated to some degree, there are sections and statues that remain untouched. I would suggest spending 1 day to visit the 4-5 top temples when in Chiang Rai including Wat Phra Kaew, Wat Pa Yia (also called the Bamboo Forest Monastery), Wat Phra That Doi Chom Thong, Wat Phra Singh and probably the most famous Wat Klang Wiang. 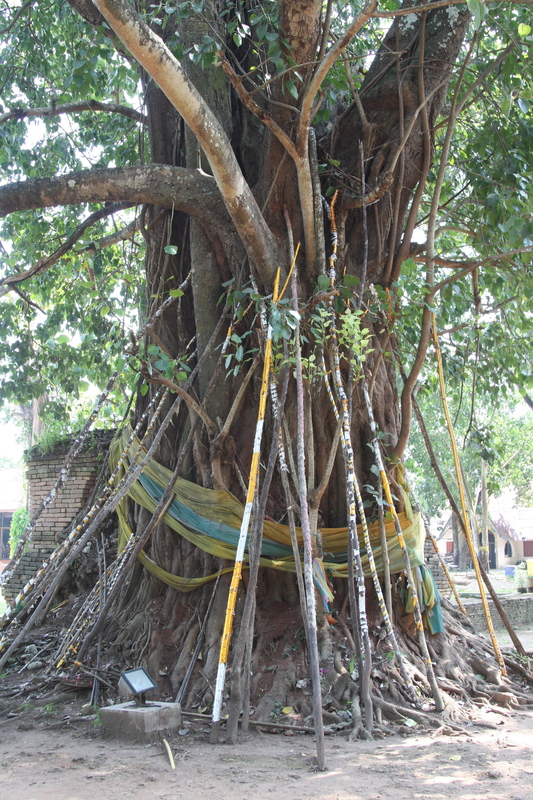 A common presence in many temples and their ground is the presence of a bodhi tree. The original Bodhi tree is in Bodh Gaya, India and is sacred as it is where Siddhartha is said to have achieved enlightenment. Nearly every important Buddhist temple has a bodhi tree on site. n Buddhism it represents the potential that is within all of us. Technically, to be called a bodhi tree, it must be a seedling from the original tree. While this is doubtful in every single case, still the tree itself has great meaning to the temple grounds. They are instantly recognizable because of their trunk girth which is formed by an intricate root structure as well as by their heart shaped leaves. Quite often you will see them decorated with saffron ribbons – the same color of Buddhist monks robes. 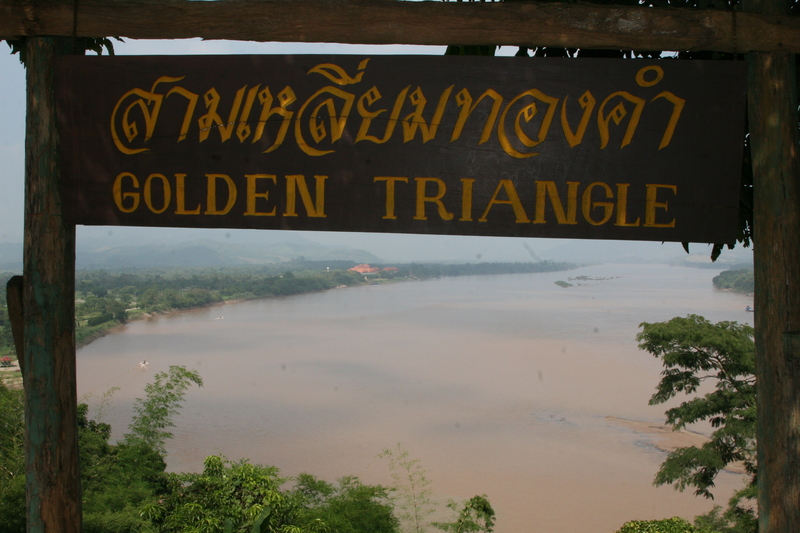 Also worth seeing is the Golden Triangle. 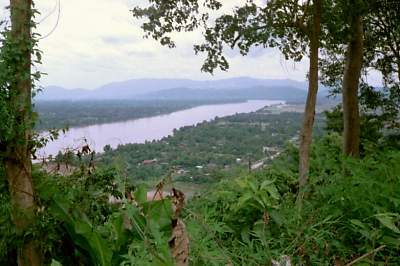 This is the area where Myanmar, Laos and Cambodia intersect – the most notable place to view it is at the intersection of the Mekong and Ruak rivers. The area itself has turned into a tourist trap, so while it’s not worth spending a lot of time there, you can visit the main viewing area on the Thai riverside near the point where the rivers meet. Also of interest is the opium museum. And of course, no trip to Northern Thailand without a bowl of the famous dish called Khao Soi This happens to be one of my favourite Thai dishes ever. It’s hard to find in Bangkok where I used to live, but it a very common dish in Chiang Rai, so nearly any boodle stand or local restaurant would have the dish. I tend to prefer to eat at the stalls that specialize in this dish, but as far as I can tell there is no such thing as a bad khao soi, so you can try it anywhere. It is something between a soup and a curry and is made with made with a mix of egg noodles, pickled cabbage, shallots, chillies and lime in a coconut milk based sauce, and then topped with deep-fried crispy egg noodles and drizzled with chili oil. Between the white temple, the more religiously important historical temples, the Golden Triangle and trying the local North foods like kaho soi, Chiang Rai makes for a nice 2 day getaway on any trip to Thailand. And whether you live in Bangkok and want a break from the big city or are just a guest in Thailand, there is something truly healing about a weekend in the North and taking in it’s mountains, fresh air and river vistas. 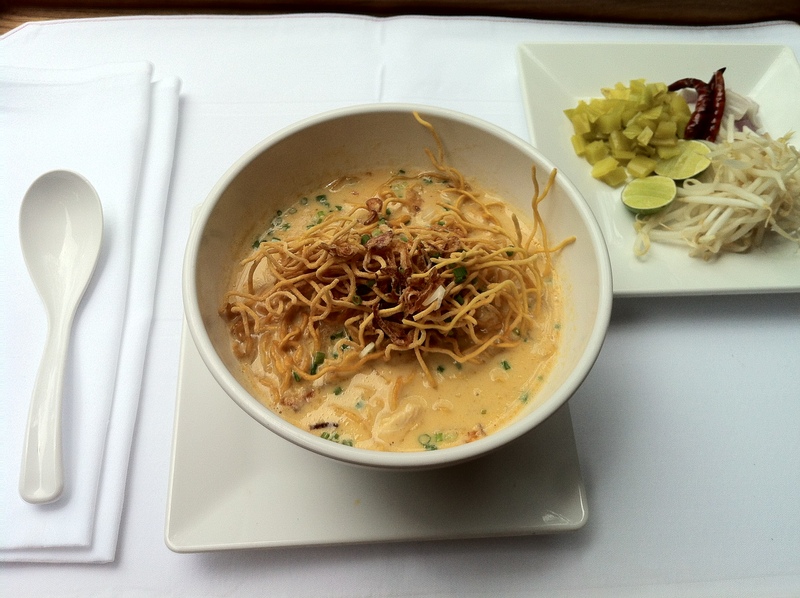 That Khao Soi looks great! 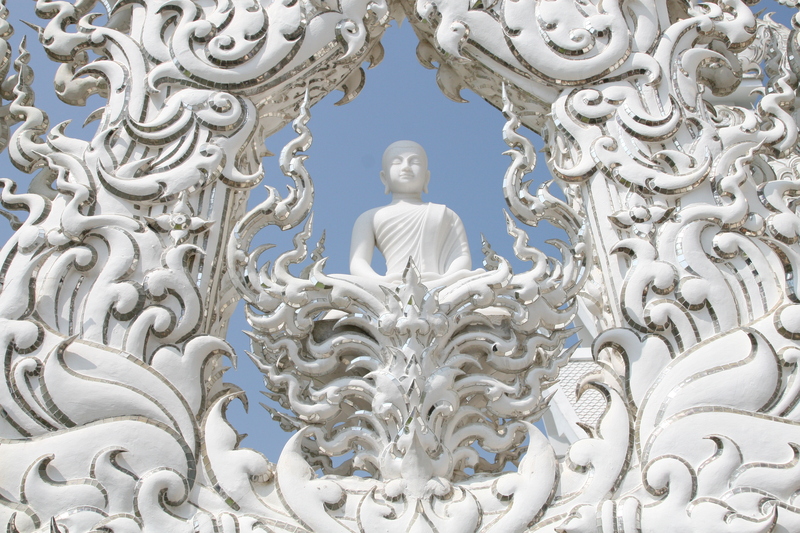 The White Temple is so strange and beautiful – definitely worth a trip up North. Thanks for the post!